Recent Emory University graduate and standout men's tennis player Ian Wagner has been selected as a spring recipient of the NCAA Postgraduate Scholarship, a prestigious honor granted to graduating athletes for their achievements on the field, in the classroom and in the community. Wagner will receive a one-time $7,500 scholarship, to be used for postgraduate study within three years. Emory has now been awarded 97 postgraduate scholarships over the school's history, and its 80 since 2000 ties it with Stanford for the most among any other NCAA institution during that time period (Stanford entered the spring season with 80 NCAA Postgraduate Scholarships since 2000, and has not reported its spring winners yet). A two-time All-American, Wagner enjoyed an outstanding career during his four-year stint with the Emory program, compiling a singles record of 88-25, with his victory total ranking sixth on the school's all-time list while his .778 winning percentage is good for the No. 10 spot. A member of the 2012 national championship team, Wagner recorded a pair of 24-win seasons in singles competition. In doubles, he compiled 86 triumphs, fourth on the Eagles' all-time chart. In 2013, Wagner and Elliot Kahler became the program's first duo ever to win a NCAA D-III Championship, with the pair concluding the year with an overall slate of 24-7. 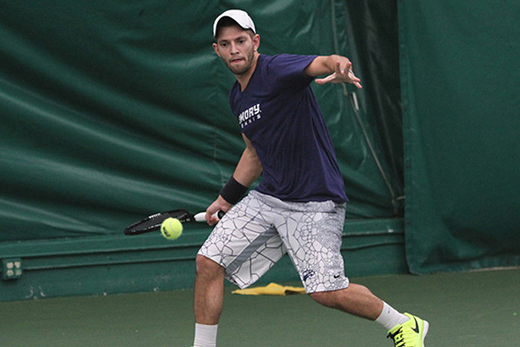 The past two campaigns, Wagner played doubles with classmate Alex Ruderman with the tandem claiming 2014-15 All-America honors following their title at the ITA South Regional Championships. Wagner and Ruderman were tabbed to compete in the 2015 NCAA D-III Championships and wound up the year as the No. 6-ranked pairing in the Division III ranks. A double major in mathematics at physics, Wagner graduated in May with a 3.83 grade-point average. A five-time member of the Emory Dean's List, he is a member of both Phi Beta Kappa and Sigma Pi Sigma (Physics Honor Society). An Intercollegiate Tennis Association (ITA) All Academic Scholar Athlete throughout his collegiate career, Wagner was the recipient of Emory's 2014 Sonny Carter Scholarship Award, presented annually to an Emory College of Arts and Sciences junior who demonstrates a commitment to developing his or her full human potential, and who clearly strives to use his or her intellectual, physical, and moral qualities for the common good. This past spring, he was the male recipient of the athletic department's Aliberti Award, in recognition of continued athletic improvement, perseverance in their academic studies and profound loyalty to Emory athletics.